The Chief Executive Officers Club International, Inc. (CEO Clubs International) is a nonprofit 501-c-3 organization which creates a nurturing environment for CEOs dedicated to improving the quality and profitability of their enterprises through shared experience and personal growth. The CEO Club was founded by Dr. Joseph Mancuso in 1977 as he left the chairmanship of the Management Department of WPI in Worcester, MA. Joe believed there should be a better way to learn than sitting in classrooms reading books and taking notes and exams. Joe feels CEOs should help one another grow their businesses by making money and having fun, while learning. Joe lives by a quote he made famous: “It’s OK to be independent, but there is no reason to be alone.” The CEO Club provides CEOs with access to peers and can be a valuable and important resource for knowledge, a means to share experience and expertise, and an opportunity to network to find resolutions to unique and sometimes common challenges and discuss/explore ways to enjoy a better, more meaningful and productive life. 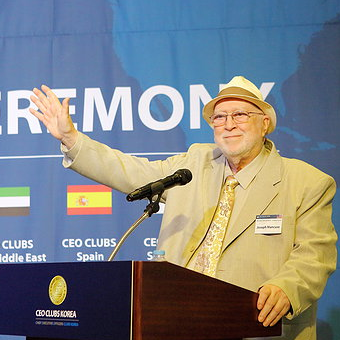 Comprised of Chapters in the U.S., India, China, South Africa, Europe, Dubai, Korea and China (and soon to include Pakistan, Australia and the Philippines), CEO Clubs International is a 40-year-old nonprofit, by-invitation-only membership association. Members must be CEOs of businesses which have above $2,000,000 in annual sales. (The average club member has annual sales significantly greater). CEO Club Chapters typically meet eight times a year for a half-day luncheon program. A member of one chapter is a member of all chapters and names, biographies and photos are protected. The morning is often spent with roundtables and a speaker typically concludes the program. Other meetings may also be scheduled with no speaker and/or with site visits or with members from other countries. Over the past three decades, CEO Clubs International has attracted many national figures such as: Ted Turner, Herb Kelleher, Peter Grace, T. Boone Pickens, Wally Amos, Zig Ziglar, Fred Smith, Richard DeVos, Royal Little, Edson De Castro, Steve Forbes, Victor Kiam, David Neeleman, Pat McGovern, Michael Bloomberg, Peter Peterson and Donald Trump, just to name a few who have addressed the Clubs. Many of these past luncheon talks are free to download in our TALKS section. Be sure to listen to the talks by Frank “The Conman” Abagnale and Bill “The Unknown Billionaire” Bartmann. They are tied with the better-known Ted Turner as most popular. Many chapters frequently hold social sessions and events where we visit awesome venues like the NY Stock and NASDAQ Exchange, the Federal Reserve Bank, Universal Studios, Pebble Beach, and the Getty Museum. We also enjoy dinner parties, boat cruises and taking in Broadway plays. Joe frequently arranges business trips between our members in different countries, especially China. Membership is by invitation and prospective members are encouraged to attend a CEO Club meeting as a guest. In the past 18 months, Joe has taken CEOs from the USA and around the world (traveling at a level just above First Class) to prominent and exotic places which include: China, India, Dubai, Cuba, Korea, Japan and, in the next few months, to Pakistan, Australia and the Philippines – some of the countries have enjoyed numerous trips by Joe (and group) during this time. Visit www.CEOClubs.org for more information.